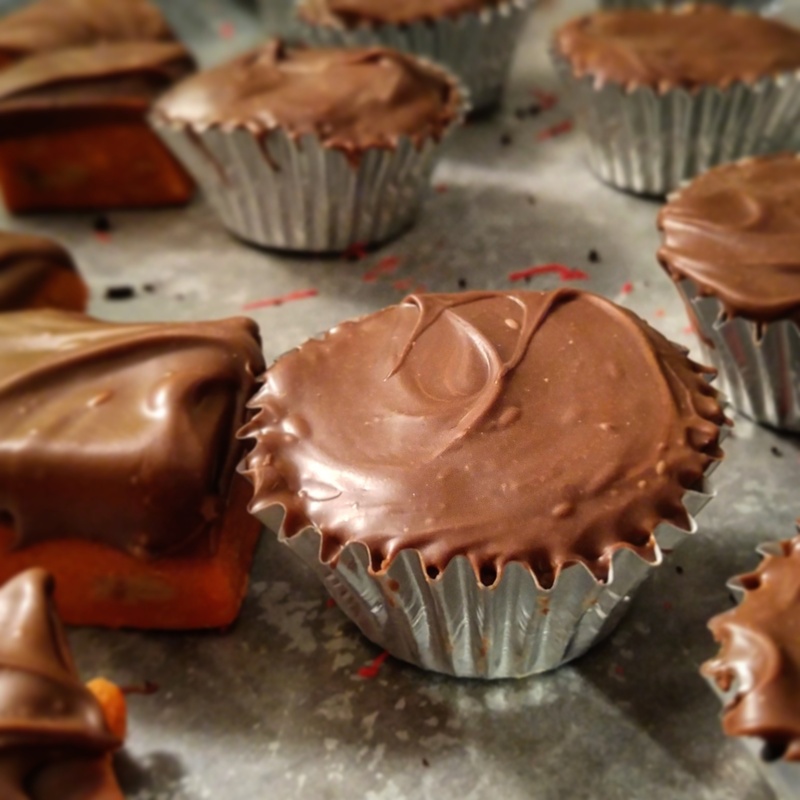 Power Packed Peanut Butter Cups | What Smells So Good? Between silky layers of chocolate is a protein and fiber filled peanut butter-maple cream. Decadent! I can't think of something I love more than peanut butter and chocolate together. Whenever we would get chocolates from Purdy's or the rare package from Laura Secord, I'd be in there as soon as I could to claim the salty-sweet treats for myself, and if we were out for ice cream in cottage country, a scoop of Chocolate Peanut Butter would be on my cone! Halloween gave me all the peanut butter cups I wanted out of my sister's bag, and I ate every last one of them with glee. As I've grown older, though, I've become somewhat pickier with my chocolate confections. While I certainly wouldn't turn anything with the combination down, I'm more on the "bittersweet truffle" train than the "mass produced candy" wagon. Chocolates in any respect don't exactly reek of health and nutrition, but I'd rather enjoy a treat than eat something cheap now. Then I found a recipe that I had to try - a peanut butter cup reminiscent my childhood, but wrapped in dark chocolate, with limited added sugar and with an added kick of protein and fibre too. Admittedly, the first batch of filling didn't even make it to the chocolate coating stage. I accidentally over-processed the chickpea and peanut butter mixture in my attempt to make a smooth filling, because I can't follow directions, and it got so thick there was no "spooning" it into cups. However, I have it on good authority that the filling, au naturale, is fantastic and a great addition to ice cream or cumbled on baked apples. Melt chocolate chips and coconut oil either on the stovetop or in the microwave until pourable. Pour ½ teaspoon of melted chocolate into each paper-lined mini muffin cup and spread it across the bottom and up the sides. Place in freezer to set. Pulse chickpeas in food processor until crumbly, but not pureed. Add the peanut butter and maple syrup and pulse until the mixture "seizes up", or suddenly thickens. Measure out 1 teaspoon of filling and roll into a ball. Set aside on a piece of parchment paper or a plate. Repeat with the remaining filling - there should be enough for at least 24 balls. Remove muffin cups from the freezer. Place one ball of filling into each cup and pat down into a flat circle, leaving a small amount of space between the edge of the filling and the muffin cup. Pour 1 teaspoon of melted chocolate mixture over the top of the filling and jiggle slightly to let the chocolate settle down over the filling. Set aside until completely set.